Given the popularity of the request we decided to look into it and started by asking: “which are the use cases in which you would throw an exception?”. 100% of the answers were: “because the data was not valid after applying some X criteria”. So, instead of doing a very raw <throw-exception /> message processor we decided to build a validations module, which throws exceptions when a validation fails. Filters are conceptually conceived to just kill event’s processing. They can throw exceptions, but you cannot customise the exception type. So if you have two filters in the same flow you cannot know which one failed. They don’t throw an exception or provide any mechanism to take action on that error. Filters often require you to write a MEL expression for each validation. Not an out of the box solution. At the end of the day, reality if that even though filters can sometimes be used as validators, they’re not conceived for that. Another option is to use a choice element to evaluate the condition and then throw an exception using groovy or other expression evaluator. This solution is quite verbose and overly complex. This feature is available starting with Mule ESB 3.7.0, in both Community and Enterprise editions. However, Studio support only became available starting with the September 2015 release. If validation fails, a ValidationException will be thrown. By default, this exception will have a meaningful message attached. You can optionally customize this message and change the type of exception thrown, as long as the new exception type has a constructor that overrides Exception(String). In most cases, there’re two ways of using a validator: through a MessageProcessor or through a MEL function. We provide a message processor for each of the validators. This is what you use when you want to perform the validations as part of your flow and you want an exception to be thrown if a validation fails. A nice thing about the message processors, is that they all accept expressions in all their parameters. The purpose of exposing validators through MEL is to use them in decision making. Unlike the message processor version, these will be boolean functions without an output message, just true if the validation succeeded, or false otherwise. All the validators are available through a validator variable automatically added into the MEL context. Checks that a given email is valid. Validates that a given expression matches a Java regular expression. The caseSensitive parameter is optional and defaults to true. Pattern and locale are optional arguments. 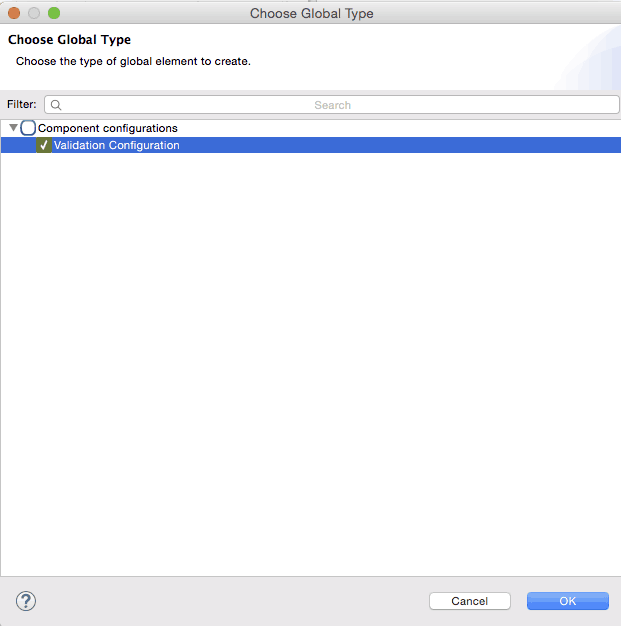 Pattern defaults to the locale’s default pattern. In the case of a String, the definition of not empty is that length is greater than zero and it’s not all whitespace characters. In the case of a Collection or Map, it refers to how many items are contained. Validates that the input’s size is between a min and max boundaries. This is valid for inputs of type String, Collection, Map and arrays (in the case of the String, the size is actually its length). The processors above validates that a String can be parsed as a number of a certain type. minValue and maxValue are optional and allow to check that, if valid, the parsed number is between certain inclusive boundaries. If not provided, then those bounds are not applied. It is also possible to specify a pattern and a locale to perform the validation. Locale defaults to the system locale. Checks that a given ip address is valid. It supports both IPV4 and IPV6. In the case of IPV6, both full and collapsed addresses are supported, but addresses containing ports are not. Validates that a given String can be interpreted as an url. This is done by invoking the URL(String) constructor in the java.net.URL class. If that constructor throws exception then the validation fails. Whatever String which that constructor accepts is considered valid. Because conceptually speaking a validator should not modify the message payload or any of its properties, the MEL expression used here is expected to not have any side effects. It makes no sense to expose these through MEL since boolean comparison is something already built into the language. If you want to perform complex validation logic, or reuse some code you already have on a separata jar, then the is-true and is-false fallbacks might not be that convenient. You might want to build your own validator. Each instance of custom-validator will create its own instance of the given class and will hold it, thus the requirement to be thread-safe. The recommended way of achieving thread safeness is by being stateless, but that’s up to the developer. This interface receives the Event which failed the validation and the validator that raised the error. This method is intended to return the exception to be thrown but not to throw it. Implementations of this interface should never throw exceptions and be thread-safe and have a public default constructor. Notice that you either provide a classname or a bean reference. You can’t do both things. You can either provide the classname of an ExceptionFactory or a reference to a Spring Bean. On any of these validators you can customize the type of exception thrown by providing the canonical name of an exception type. If that exception type does not override the constructor Exception(String) an IllegalArgumentException will be thrown. You also get the chance to customize the message of the exception thrown. 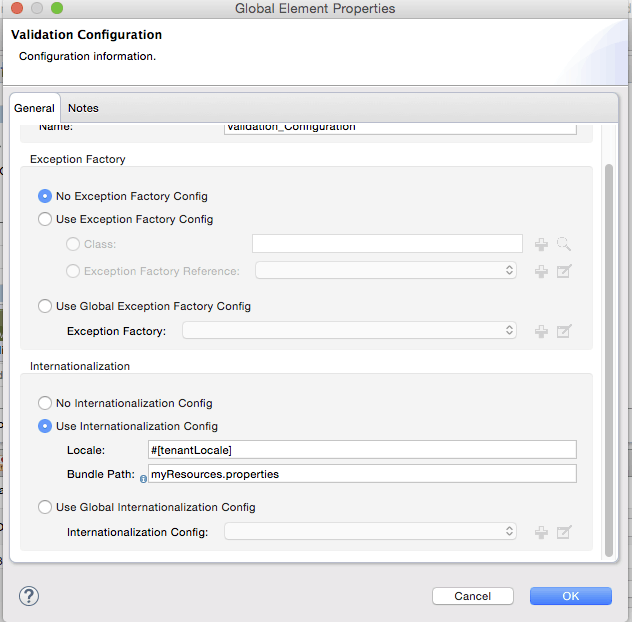 The above setting overrides the global ExceptionFactory configured in the validation config and creates the exception by those parameter. NotAnAdultException is expected to have a constructor taking one String argument, otherwise it will fail (that will be validated at start time). NOTE: You don’t have to customize both the exception type and the message, you can also just customize one of them. The example above assumes that by the time the validator is executed, there will be a flowVar called tenantLocale in which the locale to be used has been set (local is optional, it will default to the current locale). If any of the validations above fail, one single exception will be thrown. The exception contains a multiline message in which each line corresponds to each failing validation. 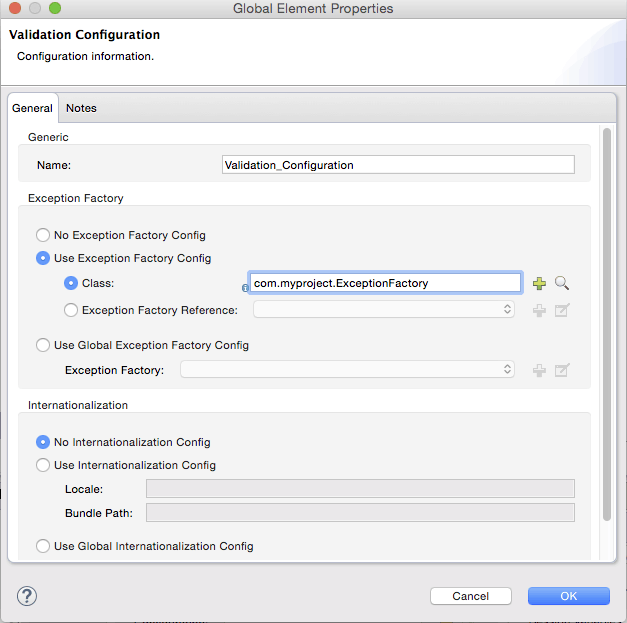 Unlike the other validators, the all validator does not allow directly customizing the exception type or the message through a validation:exception or exception factory elements (you can however customize the message of the inner validators though). That’s it. We hope you like this feature. Have feedback? Please comment!